I break out my camera to take photos in the Montparnasse Monoprix cheese section; it's one of the biggest grocery chains in the country, but this doesn't look like any cheese section I've seen in a grocery store. It's gorgeous -- better than most actual fancy cheese shops in the US, frankly. But it doesn't matter how lovingly I take these photos. The woman working there comes over and yells at me, "You can't take those photos, and you know it!" When I question both why not and how I'm supposed to know this, she gets even madder. "Of course it's a rule! You must have permission!" Unofficial national motto... "French Bureaucracy: We're Not Infamous For Nothing!" I'm pleased to report that even the French people who are with me waiting in line get up in arms on my behalf. "How would she know that it's forbidden? Is it written somewhere? Why on Earth can't somebody photograph cheese in a Monoprix?!" It's kind of fun -- dramatic and rare -- being in the middle of a bunch of French people staging a revolution against pointless bureaucracy. Ha, ha, take that you forms in triplicate! Eventually, the woman who works there decides that she would rather not be decapitated by guillotine, and so joins the revolutionaries instead. When I say I am taking photos because I'm writing about French cheeses, she goes over and breaks one open, generously passing samples around to those of us on the right side of the cheese barricade, and of history. A while later, I return to the scene of the revolution because I realize I never got a good photo of the specific cheese. I'm no dummy: I take the photos quickly, without asking. I prefer to be yelled at than prohibited. And sure enough, I get chastised by the man working. When I explain I'm writing about cheese, he too joins the revolution, stops yelling at me, and instead brings out a notebook he keeps about cheeses from around the world (boasting, "I knew about Philadelphia cream cheese before you could buy it everywhere!"). At least the Monoprix monarchy turns coat easily. Not twenty minutes later, I am chastised for taking photos of a grave stone in a neighboring cemetery open to the public, in which virtually everybody is walking around with cameras. The guard tells me, "But of course you cannot take this photo! It is a private tombstone! You must have authorization from the owner, first!" Since the owner of the tombstone is dead, I'm not sure how I am supposed to get permission from him, but let's not let small details like that get in the way of pointless bureaucracy. The guard watches while I delete the photo from my camera as ordered. Of course, the guard doesn't know that I take multiple photos (for lighting, composition), and I have about three more versions of it. Ha, ha! Take that, petty bureaucrat! And vive la revolution! Picodon is a little hockey-puck shaped and sized goat cheese from southern France that is protected under AOC status. It's usually aged 3-4 weeks and comes in a wide variety: Picodon de l'Ardèche, de la Drôme, de Crest, de Dieulefit, du Dauphiné, and even a version stored in olive oil. The one I get is from Drôme. But the biggest difference in taste is not going to be where they're from as much as how old they are. Soft and white when young, they can get downright hockey-puck textured with a strong acid, salty, goaty bit to them when old. There is enough variation that they can taste as different from one another as different goat cheeses entirely. Frankly, the first time I taste it on the occasion of the first battle of the cheese revolution, when the lady breaks it up and passes it around to us, the Picodon is cakey and crumbly. It is a little dried out, and hard, which makes it easy to break up and pass out samples, and it's also somewhat salty. But when I actually buy one, it turns out to be fresher and more like cream cheese. In fact, it is so bland, it really could be cream cheese. This is ironic, since the cheese name "picodon" is a word from the original local language, Langue d'Oc, that means "spicy." There's nothing spicy or gamey or earthy about this super young version, which makes it less exciting but very nice as a vehicle for fruit preserves or honey on toast. 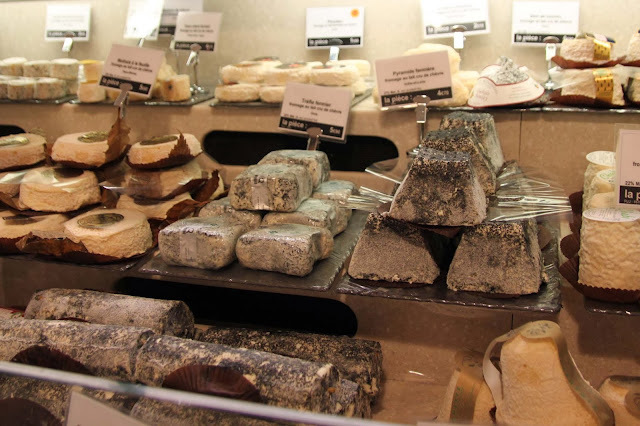 Picodon de la Drôme: the little fromage that started a cheese aisle revolution and has come to symbolize (for me) the struggle of the little guy against pointless French bureaucracy.